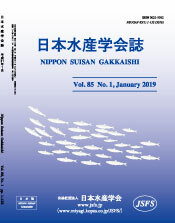 Using the mitochondrial DNA control region sequences of 549 bp for 618 Pacific herring from 16 spatiotemporal samples collected at nine spawning sites in the Hokkaido and Tohoku areas of Japan during the spawning period between 2003 and 2014, we estimated the contemporary population structure and demographic history of the Japanese herring. Neighbor-joining unrooted phylogenetic trees based on the empirical Bayes pairwise FST values showed three large clusters consisting of six local samples in Hokkaido, Lake Obuchi-numa, and Miyako Bay/Matsushima Bay in Tohoku. Hokkaido samples had higher genetic diversity than Honshu samples. The haplotype frequency of Miyako Bay after the Great Tohoku earthquake was substantially different to that before the earthquake, but similar to that of Lake Obuchi-numa. Our demographic analyses inferred that the effective population size (Ne) has expanded since at least ～600 kyr ago in Hokkaido but is stable in Honshu, but a rapid and simultaneous decrease in Ne has occurred since ～20 kyr ago in Japanese herring, corresponding to the warming after the Last Glacial Maximum. Changes in algal flora by removing the sea urchin Diadema spp. were studied in Haidaura Bay, Mie Prefecture, central Japan in 1999, 2004 and 2014. The algal flora and distribution of seaweed beds and barren ground were surveyed by skin diving at 10 sampling sites. Thirteen species of Chlorophyceae, 30 species of Phaeophyceae and 67 species of Rhodophyceae were observed during the study period. In the mouth of the bay, seaweed beds were stable and the number of algal species did not show remarkable changes from 1999 to 2014. As a result of the recovery of seaweed beds from barren grounds by removing Diadema spp., the number of algal species drastically increased in the inner parts of the bay. Consequently, removing Diadema spp. increased the number of algal species including various small algae in Diadema-dominated barren grounds.